“The Syrian President’s visit to Tehran bore a hidden yet great message. The visit of Bashar Assad with the Leader and the president of our country at this time was carried out with several goals,” he added. He added that the secret message of the trip was Assad’s response to the Americans’ new political game in which they are trying to convey this message to Assad that they can guarantee his lifetime presidency provided that Damascus distances itself from Iran and Hezbollah. Also on Wednesday, senior Iranian legislator Mohammad Dehqan said that Assad’s visit to Tehran indicated the stable situation in Syria and failure of the ISIL terrorist group and their supporters in the region. “The visit showed internal stability in Syria, failure of the ISIL, the US and Europe in the region and Syria’s loyalty to the causes of the resistance front,” Dehqan said. 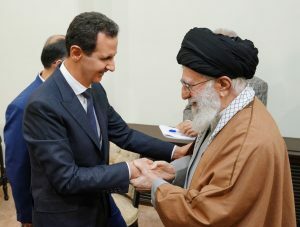 “Bashar Assad’s visit to Iran sent this message to the world that the Syrian people have won the proxy war launched by the US and its allies in the region,” he added. During the meeting, Ayatollah Khamenei praised the Syrian nation’s resistance in face of enemies’ plots, and said the key to Syria’s victory as well as the United States and its regional mercenaries’ defeat is the Syrian president and people’s resolve and resistance. I have noted numerous times my wonder and admiration of the patriotic Syrian Arab Army for standing by its President, its people, and its land in the face of great peril and pressure. Even scofflaws like Trump and his regime should recognize that prime indicator of the integrity and steadfastness of Syria.